I processed some more unknown samples today, the ones that came from last month’s big Picsearch score. I found some interesting QuickTime specimens. One of them was filed under video codec FourCC ‘fire’. The sample only contained one frame of type fire and that frame was very small (238 bytes) and looked to contain a number of small sub-atoms. 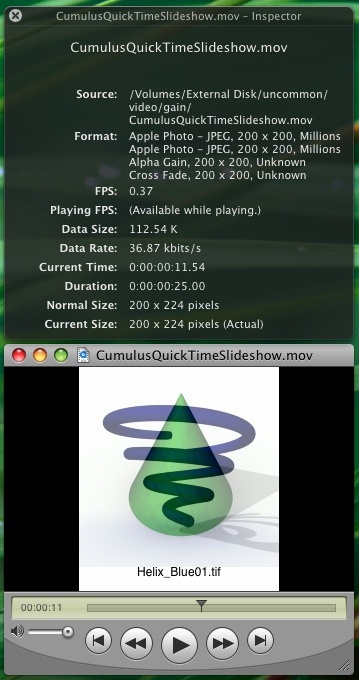 Since the sample had a .mov extension, I decided to check it out in Apple’s QuickTime Player. It played fine, and you can see the result on the new fire page I made in the MultimediaWiki. Apparently, it’s built into QuickTime. The file also features a single frame of RPZA video data. My guess is that the logo on display is encoded with RPZA while the fire block defines parameters for a fire animation. I decided to post this pretty screenshot here since I didn’t feel like creating another Wiki page for what I perceive to be not a “real” video codec. The foregoing CumulusQuickTimeSlideshow.mov sample comes from here and actually contains 5 separate trak atoms: 2 define ‘jpeg’ data, 1 is ‘gain’, 1 is ‘dslv’ and the last is ‘text’, which defines ASCII strings containing the filenames on the bottom of the slideshow. I have no idea what the dslv atom is for, but something, somewhere in the file defines whether this so-called alpha gain effect will use a cross fade (as seen with the Cumulus shapes) or if it will use an Iris transitional effect (as seen in the sample na_visit03.mov here). So much about the QuickTime format remains a mystery. If you have any experience in programming computer graphics, you probably know all about red/green/blue (RGB) video modes and pixel formats. Guess what? It is all useless now that you are working on video codec technology! No, that’s not entirely true. Some video codecs operate on RGB video natively. A majority of modern codecs use some kind of YUV colorspace. We will get to that. Since many programmers are familiar with RGB pixel formats, let’s use that as a starting point. If you are used to dealing with RGB colors, YUV will seem a bit unintuitive at first. What does YUV stand for? Nothing you would guess. It turns out Y stands for intensity. U stands for blue and V stands for red. U is also denoted as Cb and V is also denoted as Cr. So YUV is sometimes written as YCbCr. So, all minimum and all maximum components do not generate intuitive (read: similar to RGB) results. In fact, all 0s in the YUV colorspace result in a dull green rather than black. That last point is useful to understand when a video is displaying a lot of green block errors– that probably means that the decoder is skipping blocks of data completely and leaving the underlying YUV data as all 0.